• There are more Pacific salmon now than ever before since comprehensive statistics began to be collected in 1925 (i.e., catch plus spawning escapement). However, Chinook and Coho Salmon and Steelhead Trout are depressed throughout much of their range, representing only 4% of total salmon catch. • Numbers of Pink Salmon, Chum Salmon and Sockeye Salmon averaged 721 million salmon each year during 2005-2015 or approximately 36% more salmon than in the previous peak in the late 1930s. • Pink Salmon represent nearly 70% by numbers of all three species. 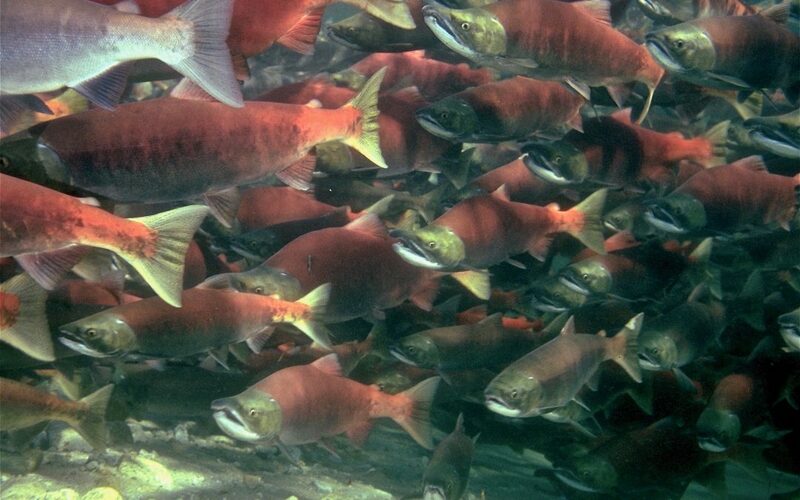 • High overall salmon abundances primarily reflect high numbers of natural-origin and hatchery salmon in northern regions where habitat is less degraded and warming ocean conditions have been generally favorable for Pink, Chum, and Sockeye Salmon. • Hatchery salmon now constitute ~40% of the total biomass of adult and immature salmon in the ocean, largely because of Chum Salmon that spend more years at sea. • Major hatchery production for these three species occurs in Alaska (Prince William Sound, Southeast Alaska), the Sakhalin and Kuril Islands (Russia), and Japan. In Alaska, up to 48% of total commercial salmon harvest is from hatchery salmon according to the Alaska Department of Fish and Game. • Salmon migrate 1000s of kilometers at sea and compete for food with salmon from both Asia and North America. High salmon abundances can lead to reduced body size and survival of salmon and lower survival of seabirds. The ocean carrying capacity for Pacific salmon may have been reached in recent decades. Research is needed to better understand the impacts of high salmon abundance on the offshore marine ecosystem, including depleted wild species such as Chinook and Coho Salmon and Steelhead Trout, and some populations of Sockeye and Chum Salmon. • The authors recommend the following changes in salmon management: 1) mark or tag all hatchery salmon so they can be identified after release, 2) estimate hatchery- and natural-origin salmon in catches and escapement, and 3) maintain this information in publicly accessible databases.